After two weeks of preparation, the day had finally arrived. 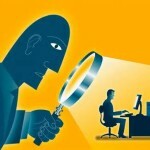 On the first anniversary of Edward Snowden’s flash out about NSA spying, the world got together to protect the web. 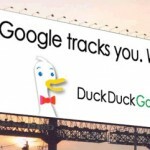 I usually supported these kinds of campaigns from the internet, but this time I wanted to make people aware about security and privacy. So our plan was to hit the streets and help people understand what’s going on and how to save oneself. I had no freaking idea how many people would show up, and how the listeners would take it. I invited my friend to work on banners for event. 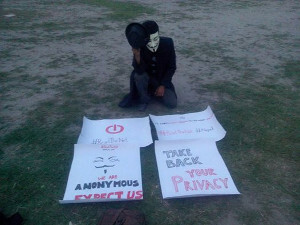 Our dressup was Anonymous Mask, MeroSanoKatha Tshirt, I tried a full coat but it was too hot. Anyways I drank some red label to fuel me up and we hit out for Basantapur, excited and nervous. In Basantapur we asked our team members to hold the banners while wearing a mask on the top of a temple. Me and a fren went out and started telling people about the mass surveillance and how they can protect themselves. We were also distributing papers about it and asked the people to read it and spread it around to their friends, childrens, parents, anyone they care about. The crowd reaction was really good, the people thanked us for information saying “people like us don’t know much about it and you guys are putting an effort to help spread such an important topic, Thank you”. Those kind of responses were really touching, it gave us more and more energy to talk. It was good to see people enjoying and taking the things seriously. Some even came to hold our banners and took pics with us. So Basantapur was a grand success, it was time to move to our next venue Thamel. We walked from Basantapur to thamel, wearing the mask and holding the banners. We created lots of traffic jams, as people stopped their bikes and cars to look at us and talk to us. In Basantapur we were the show with our banners high up the temple, but in Thamel we were in middle of crowd standing out. We were talking to people right in the road, the traffic police too came and listened to us, while he was waving his hand for vehicles to move, though no body moved lol. Everyone was stopping and listening to us, the tourists came and talked to us, wore our mask and took photoes of us. It was a great response and we can say this too was a grand success. Next on the map was Jawalakhel, so we were on our way. By the time we reached Jawalakhel, we were exhausted, we thought we picked up wrong venue as Jawalakhel was too big to grab an attention. We marched with mask and our Banners again but it was really hard to get people’s attention. Then we started moving closely and started approaching people to talk. 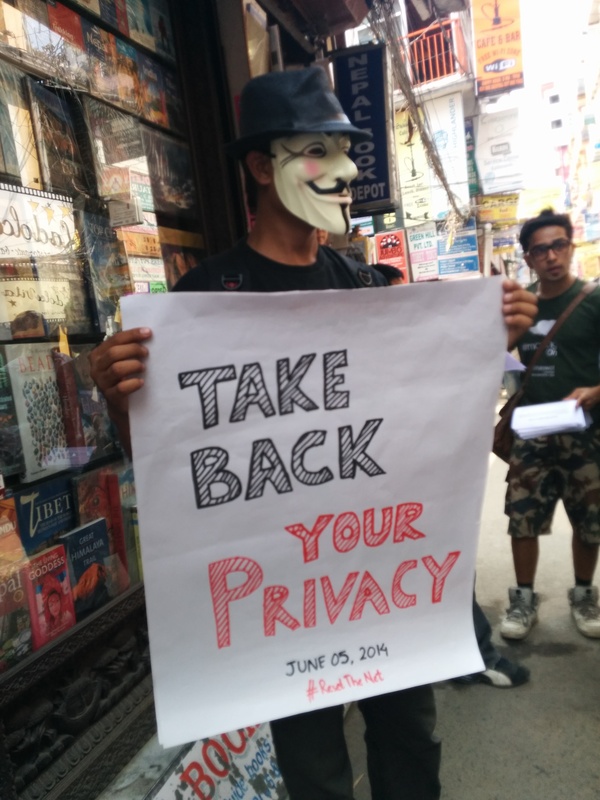 It turned out to be a good plan, we started talking and handing out informations, it wasn’t as effective as Basantapur or Thamel but we did meet some awesome people. Then we entered Jawalkhel football club, there were some seniors sitting there, we thought let’s talk to themd to people and our children. That made Jawalakhel awesome, finally we were happy about our movement here too. After the event, I placed all the banners on the ground sat on my knees raised off my hat to thank all of my team. It was a wonderful experience. We talked to variety of people from students, teachers, workers, businessman, tourists, and everyone of them listened to us with great interest, thanked us for our time and effort and wished us good luck. They had that positive vibe in them, after listening to be secure in the internet. We even operated in different kinds of environment, in Basantapur – we were the show gathering the mass and talking to them, in Thamel – we were the crazy ones within the crowd that people came and talked to, while in Jawalakhel, we were the psycho ones, giving out good information. 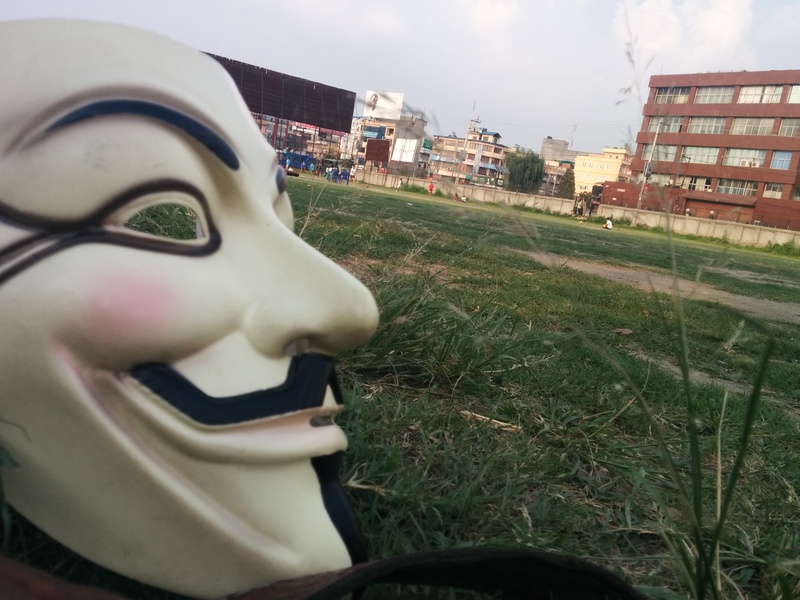 It was a start of revolution in Nepal, wearing mask and going public to raise awareness about internet, it hadn’t been done before. The fight against NSA doesn’t stop there and we won’t stop there. Looking forward to next events, after all I am crazy enough to do things I love.